In Hilton Head, South Carolina, we get to enjoy beautiful weather and temperatures for most of the year; however, it is not without its hassles. Pesky mosquitoes and no-see-ums, sudden thunderstorms, and harsh UV rays can quickly ruin a day of relaxation outdoors. 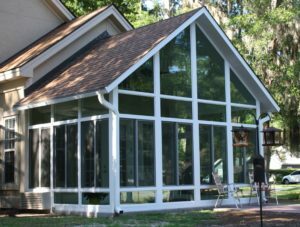 At Porch Outfitters, we offer beautiful sun room additions that allows homeowners to enjoy their outdoor spaces all year long without having to deal with any of the drawbacks. At Porch Outfitters, we are committed to providing our customers with the best value for their investment in a sun room addition. That’s why we install products from TEMO that have numerous advantages over other models. For example, TEMO sun rooms have exceptionally energy-efficient thermal wall and roof systems, which help keep them cool in the summer and warm in the winter, so you can enjoy your outdoor space all year long. What’s more, they are incredibly durable. In fact, their TEMKOR surfacing resists all forms of deterioration, so you can count on your sun room to remain looking like new long into the future. Additionally, your new sun room will make a beautiful addition to your home. Available in a variety of distinctive styles, it will be easy for you to find an option that suits your needs and matches the architectural design of your home. At Porch Outfitters, we are outdoor living experts who will construct your new sun room with the utmost care and precision. In addition to passing along TEMO’s incredible lifetime warranty, we’ll provide our own lifetime workmanship warranty, providing you with complete peace of mind. Contact us today to begin the process of making the most of your outdoor space in Hilton Head, SC.